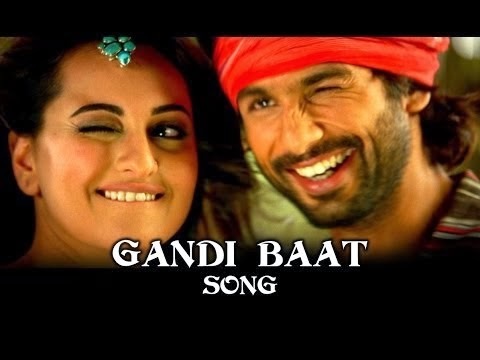 Get the lyrics of Gandi Baat song from the upcoming Hindi Movie "R... Rajkumar" here and you can watch Gandi Baat Video in HD, starring Shahid Kapoor and Sonakshi Sinha in lead roles. The movie is directed by "Prabhu Deva", music given by Pritam Chakraborty. The song is sung by Kalpana Patowary and Mika Singh. KHALI PILI ATTHARA CUP, CHAI BHI TO PIYA RE..."
TUNE BOLA HATT MAWALI BHAAV NAHI DIYA RE..."
You can also watch official trailer of R Rajkumar hindi bollywood movie of Prabhu deva here in HD Quality.